Reference: Topological Insulators, then the rest of the post. Researchers in China and Singapore say they have made the first ever 3D photonic topological insulator using a stack of thin plastic sheets embedded with metal nanoantennas. The insulator works at microwave frequencies, but if extended to terahertz or optical wavelengths, it could find use in applications such as high-power lasers, optical diodes and photonic computer chips. 2D topological insulators, also known as 2D quantum spin Hall insulators, are materials that are electrical insulators in the bulk but can conduct electricity extremely well on their edge via special, topologically protected, electronic states. Electrons can only travel in one direction along these states and do not backscatter. This means that they can carry electrical current with near-zero dissipation of energy and so could be used to make energy-efficient electronic devices in the future. In recent years, researchers have started looking at making topological insulators that work using light rather than electric currents. These structures are made from photonic crystals – materials in which the periodic variation of the refractive index means that only certain wavelengths of light are able to pass through. 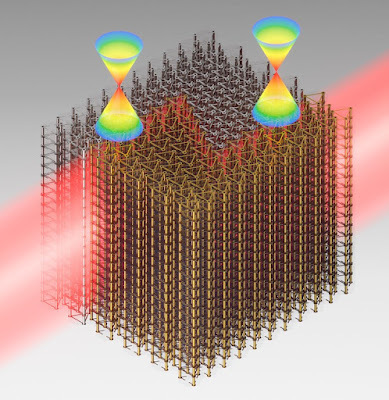 One of the advantages of these photonic topological insulators is that they can operate at room temperature, unlike their electronic counterparts. Another is that the space through which photons can travel can be engineered so that it is curved like the surface of a cone. These structures thus mimic a 2D quantum spin Hall insulator that naturally contains so-called surface Dirac cones. These are the sharp single points in a 2D material at which the valence and the conduction bands meet at the Fermi level, and at which electrons behave as though they are relativistic particles with no rest mass.